The 2019 Lake George Jazz Weekend is September 14 & 15 at Shepard Park. Jazz enthusiasts won't want to miss this weekend full of free performances by talented jazz musicians! Bring your own chairs and blankets, and picnic while enjoying the music from the lawn. You can also listen from your boat behind Shepard Park Beach. 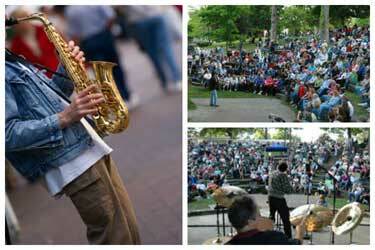 Want to know what to expect at this year's Jazz Weekend? Watch our video with footage from past festivals! Bring the family, leave your wallet at home, and soothe your soul with great jazz all weekend long! Brought to you by the Lake George Arts Project. For more information, call 518-668-2616.